True boreal forest in Nova Scotia is special; “borealized” Acadian forest is not. 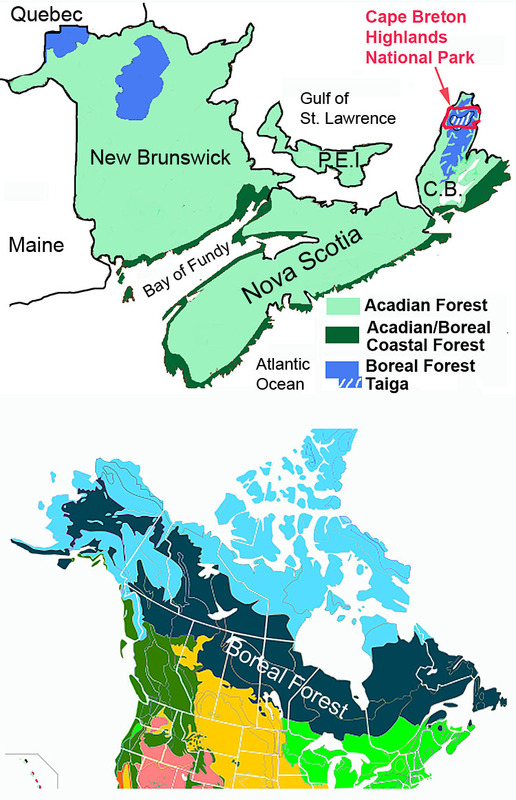 Maps show the occurrence of the boreal forest in the Maritimes (above, modified from Mosseler et al., 2003) and all of Canada (below, from Wikipedia). We go to great efforts in Nova Scotia to “borealize” our native mixed Acadian forest by clearcutting on short rotations and use of herbicide to create even-aged, conifer-dominated forests. However, true boreal forest is restricted to the cool Cape Breton Highlands, and a narrow strip along our Atlantic and Fundy shores that is cooled by the Labrador current and by upwelling of cold water in the Bay of Fundy. The 100 Islands Legacy Campaign, a conservation effort recently launched by the Nova Scotia Nature Trust, highlights the presence of essentially undisturbed boreal forest on islands off of the eastern shore of Nova Scotia; a number have been protected by the provincial government. The largest chunk of boreal forest in Nova Scotia lies in northern Cape Breton. There, coniferous boreal forest dominated by balsam fir occurs on the more exposed plateau areas while mixed Acadian forest penetrates the area in deep, sheltered valleys. On the parts of the plateau subject to most extreme weather, the closed forest gives way to “taiga*”, an open barrens with stunted black spruce and low shrubs analogous to the taiga or “Forest Barrens” lying between the northern margins of the boreal forest and the tundra in the Canadian north; it is “a piece of the Arctic in Cape Breton“. *The term “taiga” or “Taige” is variously applied to the larger Boreal Forest/Forest Barrens biome, or to just the Forest Barrens component (as in Parks Canada use of the term to describe the Northern Cape Breton ecosystems). About 25% of the boreal forest and 80% of the taiga in northern Cape Breton occur within the Cape Breton Highlands National Park. The boreal forest/taiga hosts many rare plant species and animal species at risk including Canada lynx, Bicknell’s thrush and American Martin. This fir-dominated boreal forest undergoes recurrent defoliation by spruce budworm at intervals of 30-40 years. These are natural disturbances, each followed by opening of the land, regeneration of balsam fir, and then defoliation by budworm again. However after the last budworm infestation in the 1970s, a third of the boreal forest has not regenerated properly, thick mats of grass and ferns replacing the forest and persisting. A lot scientific evidence makes it clear that the cause is a “hyper-abundance” of moose. The number within the Park, for example, increased from 66 animals in the 1970s to more than 2000 by the mid-2000s. In an effort to find a solution, Parks Canada is testing several approaches including “building fences, tree planting, and removing [culling] moose from a 20 km2 area of the park.” The experimental moose cull is being conducted in collaboration with Mi’kmaq peoples via the Unama’ki Institute of Natural Resources. In the first cull, conducted in December 2015, 37 moose were removed from the 20 km2 test area, and the 2016 cull was completed Dec 10, with 50 moose removed. The project will continue until the spring of 2018 when the several approaches will be evaluated. There is a lot more to the story than I have outlined. See links below for more about it. The moose cull has not been without controversy but on the scientific side Parks Canada’s documentation of the state of the forest and the links to moose is thorough, available for all to view, and there has been extensive consultation. I wish I could say the same for the NSDNR science behind pervasive clear-cutting in Nova Scotia. The future of boreal forest in Nova Scotia could be sketchy because of climatic warming (including changes in the ocean currents that cool the coastal boreal forest), but at least Parks Canada is doing its best to keep the Park ecosystems in good shape. Section on the Cape Breton Highlands National Park website. Nova Scotia Nature Trust led campaign to protect an island archipelago on Nova Scotia’s Atlantic coast. Many host undisturbed boreal coastal forest. The Province of Nova Scotia has protected a number of them already, see Eastern Shore Islands Wilderness Area. Fundy Model Forest document, 2007, with slides. Describes historical (European) alteration of the Acadian Forest including “borealization”. This entry was posted in Acadian Forest, Conservation, Mi'kmaq, Natural History, NSDNR, Parks & Protected Areas, Show Us the Science, Wildlife. Bookmark the permalink.